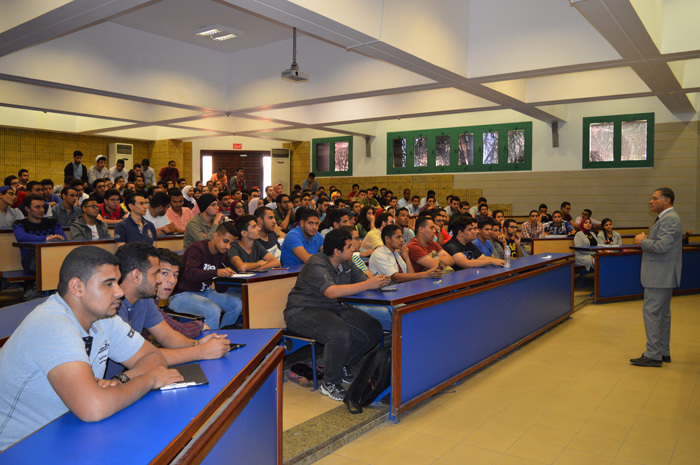 The faculty of Engineering arranged a number of orientation sessions for the new students on Tuesday 17/10/2017 to get them acquainted with the faculty’s departments and activities. The sessions were attended by Prof. Mohamed Gaber, the faculty Dean, heads of departments, faculty members and teaching assistance staff. The departments that participated in the orientation sessions were Petrochemicals Engineering Department, Electrical Engineering Department, Construction Engineering and Management Department, Computer Engineering Department and Basic Engineering Department. The first session was for the Petrochemicals Engineering Department where Prof. Mohamed Fahim, the Head of Department gave some words in which he welcomed the new students and paid heed to their suggestions and aspirations towards the department’s study programs. Prof. Mohamed Fahim also gave a presentation to outline his vision for the future development of the department undergraduate study programs as well as the postgraduate programs that are going to be opened during the new academic year 2018-2019. The session also included a presentation by some of the department students about the Society of Petroleum Engineers (SPE) and how to join it. By the end of the session, the department academic staff had breakfast with the students. 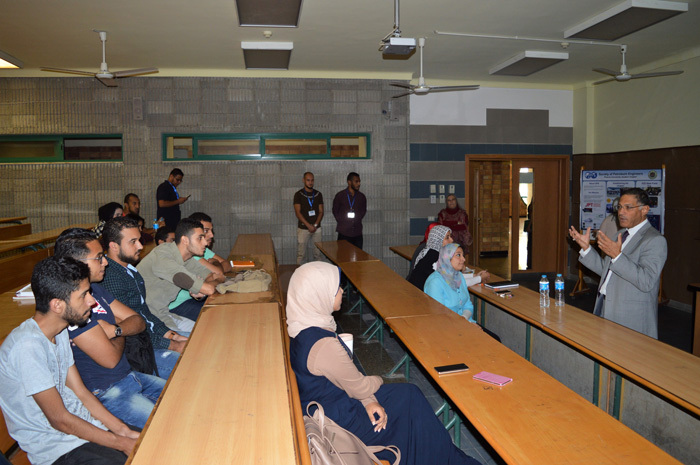 As for the orientation session of the Electrical Engineering Department, it was opened by a word for Prof. Mohamed Abd-El-Rahman, the Head of Department in which he welcomed the new students and wished them success. He also acquainted the students with the department academic activities, field trips, internships, among others. He also referred in his word to PUA Career Development and Entrepreneurship Center (CDEC), its mission and what it can provide the undergraduate students and alumni with. This was followed by a word by the leader of IEEE Club in the department in which he introduced the club activities to the new students. Discussions were then opened to respond to the attendees’ enquiries about the department. 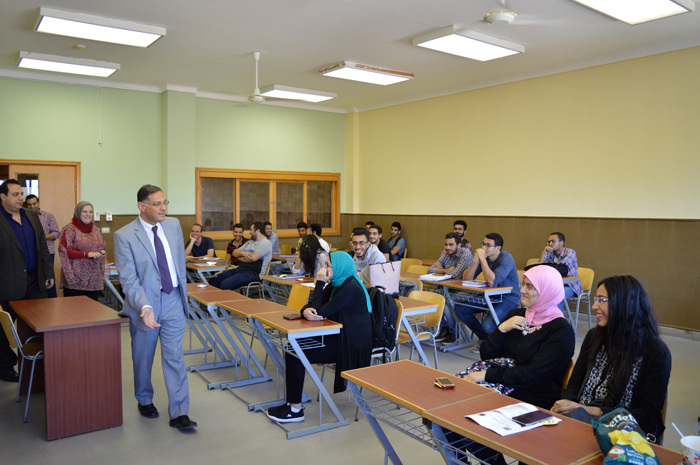 Concerning the orientation session of the Construction Engineering and Management Department, it was opened by a word for Prof. Hassan El-Ghazouly, the Head of Department in which he welcomed the new students. 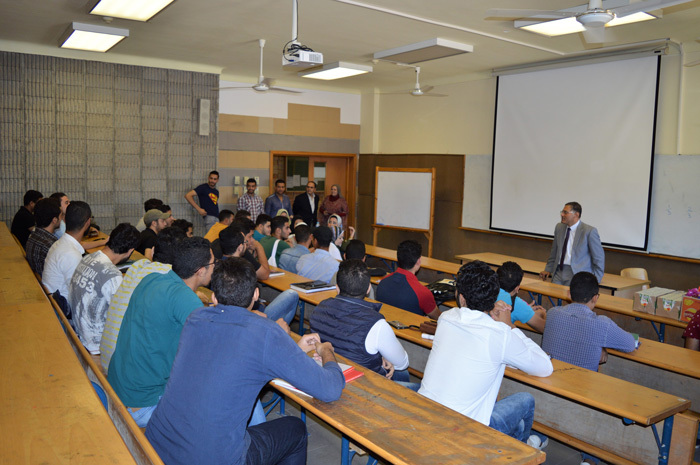 This was followed by a word by Prof. Mohamed Gaber, the faculty Dean in which he introduced the students to the department academic staff. Eng. Shaimaa Shaban also apprised the students of the department student activities, scientific trips and extracurricular activities. Then, Eng. 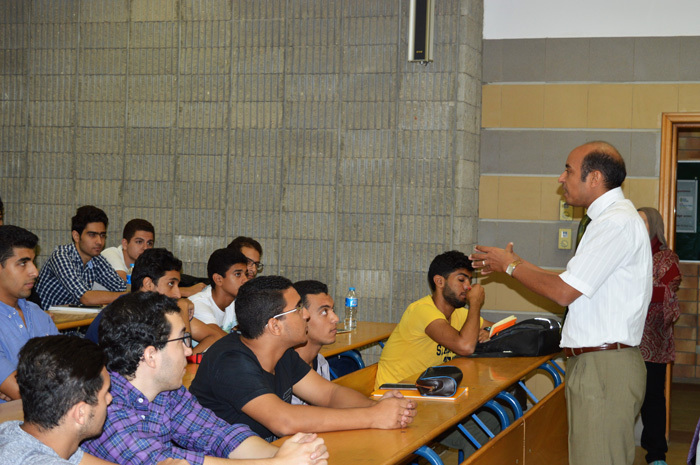 Moataz Ehab oriented the new students towards the department’s scientific club and the competitions it held. In addition, the students were made known to the field training by Eng. Mohamed Abo El-Wafa. By the end of the session, students had breakfast with some of the academic staff. The Computer Engineering students were also oriented towards the department in a session that was opened by the Dean who motivated them to work hard and acquainted them with the considerable significance of Computer Engineering Sciences and applications for other fields. An atmosphere of cordiality and friendliness dominated the session. With respect to the Basic Sciences orientation session, it was attended by the Dean, the Head of Department, faculty members and teaching assistance staff. At the outset of the orientation session, Prof. Mohamed Naeem, the Head of Department, gave a word to welcome the new students. Dr. Alaa Khalil, the student activities Leader in the department, also oriented the students towards the extracurricular activities held at the department. This was followed by some words by some representatives of the faculty clubs in which the students were made known to the different activities of those clubs and the importance of joining them. Discussions were then opened to respond to the students’ enquiries about the department. By the end of the session, the students had breakfast with some of the academic staff and took photos for memory’s sake with them.